We do all the work for you. No Measuring! Our outdoor TV covers are manufactured using Sunbrella Marine fabric in a variety of designer colors. 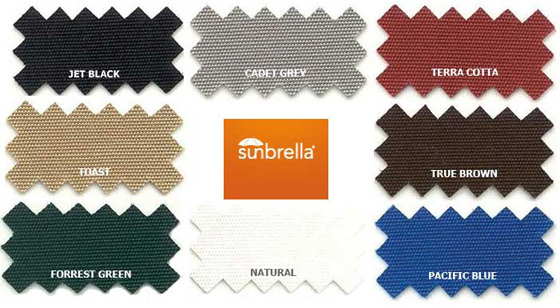 Fade-resistant Sunbrella fabrics protect your investment from water and all kinds of weather. And because it's woven, Sunbrella breathes, so it doesn't trap heat and moisture like vinyl. Vinyl can mildew, but Sunbrella looks great season after season. All Weather TV Covers manufactures custom fitted outdoor TV covers that are designed to protect your outdoor Television from the elements and coordinate with your existing decor. Depending on what type of mount you have. Swing Arm - outdoor TV cover closes down the back around the mount and across the bottom to fully enclose the TV. 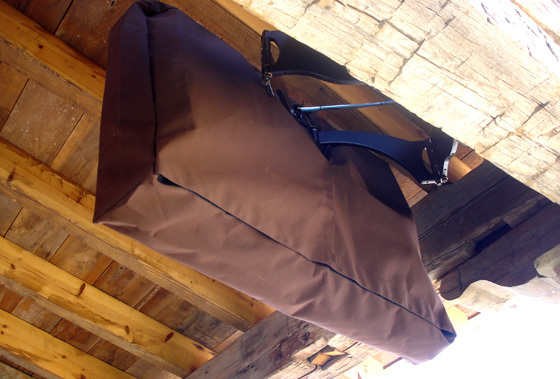 Double Articulating - outdoor TV cover adds extra depth to accommodate for the larger mount. Wall Mount - outdoor TV cover has a three panel back which fits in between and on both sides of the vertical brackets covering the back and across the bottom to fully enclose the TV. Low Profile - Wall Mount outdoor TV cover surrounds the front and sides of the TV for a snug fit. Ideal for recessed mounting or hard to reach placements. Ceiling - Designed for ceiling mounted TVs. Offers the same full protection as our swing arm covers. Drop Over - Best for stand mounted TVs. Designed with an open bottom for easy on and off. All our covers are custom made when you place an order. Here, customer service is king. We are committed to providing you with the best buying experience before, during and after your purchase. If you have a custom installation, we are here to help you design a solution. We are a family owned Texas-based company serving our customers for over nine years! Our highest priority has always been to deliver a quality product made with performance proven materials. Outdoor living has become extremely popular, so it is only natural that people would want to add audio/video entertainment to that lifestyle. So to help you protect your investment and fully enjoy the outdoor lifestyle, we've created a range of custom fitted outdoor TV covers. Most flat-panel plasma and LCD TVs aren’t weatherproofed, so placing them outside can prove harmful to the display. Placing them under a patio cover provides a first line of defense. The second is to keep them protected with a durable and attractive All Weather outdoor TV cover.